The Palms at Wailea, #207 . Ground Floor, full Air Conditioning throughout the condo. 2 reclining lounge chairs and 2 easy chairs along with a patio table, 4 chairs and Weber BBQ on the lanai. Peek-a-boo view ocean and garden view from lanai area. Our rates are based on 2 guests. Add $15 per night extra per additional person up to 4 guests maximum. Condo accommodates 4 people maximum. Split air conditioning unit throughout the entire condo. Our Palms at Wailea, #207 spacious deluxe villa is a 1 bedroom, 2 bathroom ground floor corner unit. We are close to the pool for easy access, but far enough away to avoid pool noise and located in an area without constant Okalani street traffic noise. Keawakapu, Ulua beaches are within walking distance. Upscale shopping and dining at the Shops at Wailea are just minutes away by car or on foot. NEW AC installed in master bedroom and living area. Floor and ceiling fans in bedroom and living area. The Palms at Wailea is a luxury low rise, low density property located in the popular Wailea area of South Maui The complex is just across the street and very near three of Maui’s best beaches: Keawakapu, Kamaole III and Ulua/Makapu (great snorkeling) beaches. We supply you with a WELCOME PACKAGE to get you started. Items include: Coffee, coffee filters, kitchen sponge, 1 roll paper towels, dishwasher detergent, dish soap, laundry detergent, soft soap, 2 rolls toilet paper in each bathroom, shampoo, soft soap and body wash.
We also have other cleaning supplies, miscellaneous seasonings, condiments and teas which vary, along with a well stocked kitchen. The Palms at Wailea is a well constructed desirable luxury and upscale villa complex with only 150 rental units. It is a low rise, low density property which means, peace and relaxation with privacy and personal space. There is a spacious salt water infinity pool overlooking a central garden area, the ocean, Molokini Crater and the West Maui mountains. Enjoy all The Palms at Wailea has to offer with a location close to beaches, shopping and restaurants. Take a dip in the salt water pool, enjoy the views, or just sit back on your private lanai for morning coffee, meals or the drink of your choice. Walk to Keawakapu and Ulua beaches. Tennis and Golfing within minutes of the condo. GREAT LOCATION. Garden and peek ocean view from the lanai seating area. EXCELLENT VALUE, CLEAN, REMODELED BATHROOMS, FREE WiFi, AIR CONDITIONING in Master Bedroom and Living area, CEILING FANS in bedroom and living area. Lock Box entry, Salt water infinity pool & spa, Weber gas bbq. Stocked with beach towels, beach items and many extras. Close to the pool and an easy walk to Ulua and Keawakapu Beaches. We have an on island representative for emergencies. Conveniently located in Wailea with access to top rated resorts, spas, tennis and golf facilities; world class shopping (The Shops at Wailea) and restaurants abound. Expansive lanai and personal gas bbq for guest use. Upscale Hawaiian atmosphere and additional privacy while enjoying your lanai views. Quiet and relaxing location for that well deserved get-a-way. Rest or play, you decide. Our condo accommodates up to 4 guests maximum. Its all about the LOCATION and VIEW. We have both a garden and small peek of an ocean view from our front lanai. There is tile flooring throughout the villa which extends onto an expansive #473 sq. ft. private lattice and covered lanai. Our downstairs end unit is decorated in a Tropical Hawaiian decor which completes this comfortable and desirable condo to call your home away from home. Perfect for honeymooners, couples, families, seniors, special get-a-ways and business travelers and single travelers. GOLF and TENNIS enthusiasts can enjoy 5 golf courses and 2 tennis clubs within a 5-10 to minute drive. Fantastic weather in South Wailea. The trade winds create cooling breeze throughout the unit. Fully stocked kitchen so you can prepare your meals in, if desired. Love to walk...take a leisurely stroll to the tropical pool with a waterfall feature in the garden area. There is also a path that takes you down to the beach area. Use our coolers, beach bags, chairs, boogie boards, swim noodles and snorkel gear. (supply varies) Enjoy spectacular beaches and soft white sand within walking distance. Keawakapu Beach is one of our family favorites. Its also a fantastic running or walking beach and kid friendly. Excellent snorkeling nearby. Our closest favorite snorkeling is Ulua Beach, less than 1/4 mile away. Enjoy upscale shopping and restaurants at The Shops at Wailea or many other local stores in the Wailea/Kihei area. Close to grocery stores (Safeway (our favorite in Kihei) also Foodland and health food store which is closer to the condo), Walk or drive to all. We take great pride in our condo and hope you will enjoy our home away from home as much as we do. Check our calendar for available dates. We look forward to hearing from you. Long time resident of Maui since 1994. 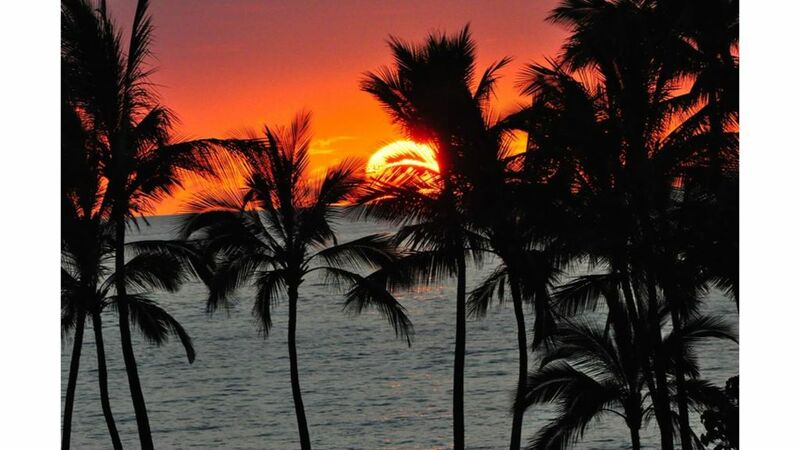 We have a love for the island, its people and all that Maui has to offer. The Spirit of Aloha awaits you. We look forward to sharing our little piece of paradise on Maui with you. Quiet location, just minutes from anything you'd want. Salt water infinity pool with lush well manicured tropical grounds and easy stroll to Keawakapu beach, Ulua snorkeling and a walking path that extends to the Fairmont Kea Lani Resort. Shops at Wailea and many restaurants within 1/4 mile of condo. Both bathrooms have been remodeled and have walk in showers, tile flooring, new vanities, toilets, sinks and faucets. Window in Master bathroom and private toilet closet. FREE Included at NO CHARGE Wireless network and password is located by the living room television. Information by living room television. Stainless steel, above the oven. Misc. seasonings and food items, some condiments as well. Use what you want, leave what you want. Fully stocked with everything needed for your cooking pleasure. Misc. seasonings and BBQ equipment included. 473 sf covered and lattice lanai. Extremely spacious for lounging, dining and BBQ use. Some snorkel gear and misc. beach items. Items vary. Minutes away at Wailea Tennis Club and Makena Resort. There are also public park tennis courts. World renowned Blue and Gold course just minutes away. Not recommended for wheelchair use. Only a few steps but not accessible for wheelchairs. Salt water infinity pool. Short walk from condo. Beautiful condo. Enjoyed staying in your condo Jillian. I was sick the first four days but felt comfortable and liked the fact that your patio was private and shaded. So sorry to hear you were sick for your first few days of the Maui trip. I'm glad to hear you were comfortable at the condo and on the large lanai. We spend most of our time outside on the lanai and tend to eat most of our meals there as well using the Genesis Gas BBQ. Thanks for your great communication and leaving some extra food and water items at the condo when you departed. Hope you will be back another time. Fantastic vacation. Great unit. Comfortable bed. Spacious living area and large deck. SO well equipped with beach chairs, snorkels & masks, beach umbrellas etc. Kitchen was full of all sorts of useful spices, condiments etc. The only issue was the pool closure (maintenance) while we were there (3 days). This was our first trip to Hawaii - we will be back. Thank you! Pleased the condo suited your needs and had all the items you needed for a great stay. There was tile repair done on the pool during part of the guests 10 day stay. Unfortunately the owners have little control over when property maintenance and scheduling is done. Once notified by Property Management I inform my guests immediately. I was however able to offer our guests the use of another condo pool during this time. Hope you had a chance to experience Maui's excellent beaches within minutes of the condo and the many other activities available. Mahalo for your kind and helpful review.. The amenities, location and comfort of this condo was spot on! We will make this one of our favorites on VBRO. The hosts responded quickly and made sure the condo had all the vacationers needs. We would highly recommend this condo. So pleased you enjoyed our condo accommodations and location. Nice spacious Modern Clean Luxury Condo! We loved our stay in this unit. Place was very clean, modern and well equipped with everything you could ever need. Jillian was excellent to deal with. Highly recommend. So glad you enjoyed our updated condo. You were excellent guests with great communication. Hope you'll be back? I'm a bit surprised by my guests comments as they had stayed with us before.. Since their last stay in 2016 we added central AC, new lanai lounge chairs, lanai table with chairs, and changed out many of the furnishings from their previous stay. All tvs work a bit differently these days. I'm sure our guest will be pleased to hear we just purchased (Jan. 2019) a NEW 55" flat screen, smart, blue tooth television for the living room. Unit 207 is very well equipped, well furnished both inside and on the lanai. There is a small ocean view on the south end of the lanai which gives sunset views. Proximity to the pool is great, no traffic noise and the landscaping is lovely. We really liked the fact that the fridge was stocked with all of the essential condiments and more! Closest beaches are Keawakapu and (Ulua; great for snorkeling). Kamaole III Beach park is also in close proximity. You can easilly walk these beaches. Close to everything. NOTE: RE: DAMAGE PROTECTION We require rental insurance or a security and damage deposit of $300 held via credit card in case damages occur. We do not pre-charge your card. Our condo is a corner, ground floor, 1 Bdrm, 2 bath (remodeled bathrooms), #1022 sq ft living and #423 sq ft latticed and covered lanai space, gas bbq, tile flooring, Split AC, Ceiling fans, Stainless appliances, cool, close to the pool and a quick walk to Keawakapu Beach. See Cancellation policy attached to contract rental agreement.